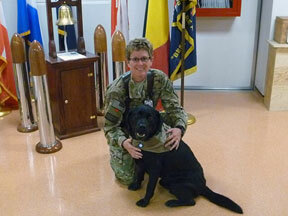 Lynne Vining poses with one of the therapy dogs in the NATO Role 3 Hospital in Kandahar Air Field, Afghanistan, where she is the team leader. But right now, she is at war. Vining is a lieutenant in the Navy serving as an intensive-care nurse specializing in combat trauma. She is the team leader at the NATO Role 3 Hospital in Kandahar Air Field, Afghanistan, in support of Operation Noble Eagle and Enduring Freedom — dirt sailors. “That’s what we call ourselves since we are nowhere near water or a ship,” Vining says. Vining has been on the mind of many co-workers since her deployment began in February. She’s been in contact with friends and colleagues through e-mail during her time overseas, sending a note home when she can. Vining’s first e-mail was sent in early March to colleagues Velinda Block, chief nursing officer of UAB Hospital, nurse Jennifer Oswald and Autrey. Vining described in vivid detail what her life had been like in the first few short weeks in Afghanistan. Vining describes the conditions as rigid. Travel is tricky with cars all over the road. Even though her hospital is only a mile from her NATO barracks, Vining says her group has to take a zig-zag path to the hospital to avoid the smaller two-lane roads. Vining says her living quarters are decent and “supposedly” rocket-proof. The Role 3 Hospital where Vining works has four operating rooms, 16 trauma bays, a clinic and a 35-bed general ward. The working conditions aren’t quite what she’s used to in UAB Hospital. The lack of luxury items forces Vining and her co-workers to be creative, using medical supplies they have on hand. Vining, who was a member of Alabama’s Army National Guard from 1986-92, says working in trauma and burns at UAB prepared her for combat-zone deployment. The injuries Vining sees in Afghanistan are the worst of the worst. 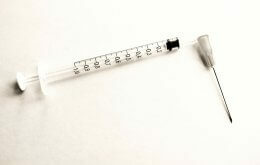 Many occur from improvised exploding devices, gunshot wounds and fractures. Autrey has known Vining for almost all of her time at UAB. Vining was her master’s student in the hospital administration program, and the two have become very good friends through the years. The practical jokes they pull on each other — mostly the ones Vining pulls on Autrey — are legendary. Autrey, a former Army captain in the nurse corps and member of the Army helicopter pilot program, says she asked Vining once why she wanted to join the Navy as a nurse and serve in a combat zone. “This was on my bucket list,” Vining says of being commissioned and serving overseas. Vining misses a lot of things about home — her mom (whom she calls every day), family and friends, her dogs, Diet Mountain Dew and co-workers all are on that list. “I do miss my staff and team mates, and wish I could give them a big hug and word of encouragement when they need it,” she says. But she’s more than halfway through her nine-month deployment and knows she will see them all in September. For now, Vining’s e-mails certainly convey the sentiments that she’s right where she belongs at the moment — among the sandstorms, chaos and her fellow soldiers, especially those she treats. She has watched young men and women reduced from strong, upright soldiers to triple and quadruple amputees flying through the ER doors. They are almost always awake, tourniquets to all extremities and no breathing tubes when they come in. Bedside Purple Heart medal presentations often follow these traumas. Those, she says, are never easy. Vining shares her experiences — good and bad — with her friends in her e-mails home. She’s glad to get an opportunity to remind everyone of the dangers our enlisted men and women face each day.